The festival calendar for June in Glasgow is heaving. And whatever you fancy, there’s something for all tastes. 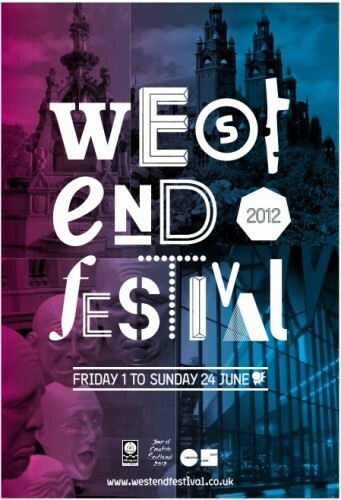 The West End Festival takes over most of the month (1 – 24 June) with more than 500 events spanning music, comedy, theatre, dance, street parties and even an opportunity to connect with your inner artiste at their fiddle (ukulele, accordion, guitar or accordion) workshop. We like variety! Part of the WEF – but taking on a life of its own, the Chamber Music Project at Cottiers runs from the 1-22 June. And even if you’re not a classical music fan, with nearly 30 different concerts and the potential of free entry for those who can muster a Beard Like Brahms , it’s worth a go. 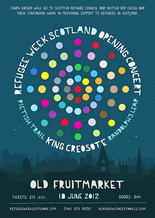 Refugee Week Scotland’s week-long arts and cultural celebrations kicks off next week 18 -24 June. With over 100 events, many of them free – it’s a great way to support their work helping some of our city’s most vulnerable rebuild new lives in Scotland. And Mercury Nominated King Creosote is lending his musical genius to their opening gig on the 18 June at the Old Fruitmarket – not to be missed. As the name suggest, The Hidden Lane’s all-day extravaganza is down a cobbled lane off Argyle Street, though is less and less hidden as it grows in popularity. And just what’s in store on Saturday 23? A mish-mash of music, creativy, fashion, food, market stalls and the promise of a jazz lounge – new this year. What’s not to love? If you’re looking for something a little more theoretical rather than theatrical, catch the final days of the Science Festival ending on Sunday. Promising to ‘hand you the keys to the cosmos’, its plethora of events, talks, shows and demos offer a fun way to connect with your inner geek and appease curiosities. As for any reluctant Sci-fest goers – there’s even astronomy for beginners. So get out there and enjoy the best of the fests in this great city. And watch out for July – Merchant City Festival is already at the top of our list.